Last week I have posted pictures of vulnerable young animals on facebook. 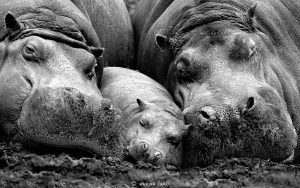 You could see a small hippo sandwiched between two strong, caring, full grown hippos. 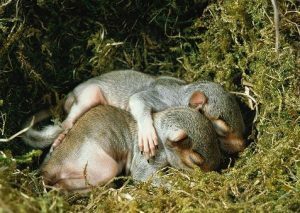 You could see two vulnerable young grey squirrels searching for warmth and shelter with each other. 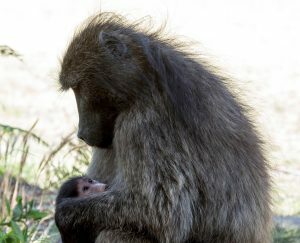 We see a young baboon in the protective shelter of the arms and body of its mother. It is looking at her with innocent, interrogative eyes. 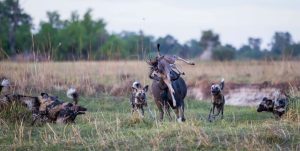 We see a wildebeast mother who is desperatly fighting for the life of her calf, who has no chance on its own against a bunch of wild dogs. What I intent to show you is a mirror of one of the strongest experiences in your life. You are looking in the mirror of your own helplesness and vulnerabillity, which has its roots in the first years after you were born. You had moved in a few hours from a state of comfort and safety in the womb to the experience of being able to die. Squeezed in this narrow tunnel, not knowing what scary thing was happening felt like your world was falling apart. And the first thing you did to save your life was to pull in your energy close around you. To achieve this, you cramped your body; you contracted your little hands to fists; you squeezed your eyes tight; everything you could constrict, you constricted. This is what you can do when you feel in danger. It is the basic tool of your defense system. It is like making yourself as small as possible and shutting everything down. There is a clinique in Paris where they have understood very well how important it is to give a baby the change to calm down after birth and to let go of that first contraction. The way they invite a baby to surrender to life instead of fighting it, is deeply moving. And somehow when you watch this video, you possibly will feel a soft longing yourself, that this way of connecting with you, had been there for you. Not able to take care of your own needs, you were depending totally for care and protection of your parents. Without them you would’t make it. You were no plant, you knew it instinctively and all your attention, all your hope was focussed at them. But how loving and caring your parents maybe were, it was impossible for them to fulfill your needs as perfectly as it was regulated inside the womb. 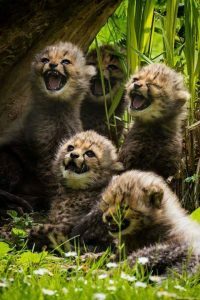 For an vulnerable, helpless child it feels like dying when it has to wait like these five little cheetahs for some food. As a baby you had no notion of time, no idea when you would get something to eat or to drink. All you knew was a burning fire, because the body needs food to survive. This helplesness is your first self image. It is rooted deeply into your mind. At the basis of your personality the idea is rooted that you are helpless and you need somebody to take care of you. This explains why you are so obsessed by other people and why you can experience overwhelming pain when you are left alone or lose someone. It is like your happiness is taken away from you forever without that person. Allthough it can hurt to lose someone, it is the memory of our early years lying underneath it, that makes it too hard. In Afrika survival is everywhere. You can not miss it. People are living very closely to the basic essential needs in life; food, water, oxygen, sleep and warmth. How to get money is allways on their mind and strangely enough it is like that in rich country’s also, allthough we live in abundance. How is that possible? The first time I learned about this concept, it was hard for me to recognize this principle inside me. Holland is very rich and all material things are well taken care of. Therefore survival was not on the surface of my mind. I really had to dive deeply into the subconscious to connect with the simple truth of the essential drive of my mind: to survive and to make sure there is allways someone to take care of me. But once I saw it, all suffering became clear to me. Because how is it possible to be free, powerfull, clear and joyfull when I still believe on the subconscious level that I am helpless and I am in need of someone to take care of me to survive. To break this hypnozis you are prisoned in, you only have to see that you are no longer an infant but a strong and capable adult. An adult who is fully capable to take care of himself, an adult who is complete and whole. This does not mean you do not enjoy the company of other people, it just means you are no longer dependent of them to survive in life. You will need to bring this understanding to all levels of the subconscious. There are many techniques to do that. Once recognized and understood a deep relaxation of your mind and body will follow. And when we relax, we begin to shine. This blog is inspired by the teachings of Jeru Kabbal. His clear, loving and realistic perspective on the mind and who we truly are, changed my life into the powerful adventure it is supposed to be.